Manila/Amsterdam, 16 October 2007 - Apple´s iPhone contains hazardous chemicals and materials, according to the results of scientific tests commissioned by Greenpeace and released today. This is the first testing of an Apple product following the commitment by Steve Jobs, Apple CEO, to a `Greener Apple´, in May 2007. An independent scientific laboratory tested 18 internal and external components of the iPhone and confirmed the presence of brominated compounds in half the samples, including in the phone´s antenna, in which they (1) made up 10 percent of the total weight of the flexible circuit board. A mixture of toxic phthalate esters (2) was found to make up 1.5 percent of the plastic (PVC) coating of the headphone cables. The insight into the components of the iPhone is presented in the Greenpeace report, `Missed call: the iPhone´s hazardous chemicals´(3). This is the third time that Greenpeace has tested an Apple product since 2006. Similar analyses of a MacBook Pro and an iPod Nano also revealed the presence of brominated flame retardants and PVC in some components. 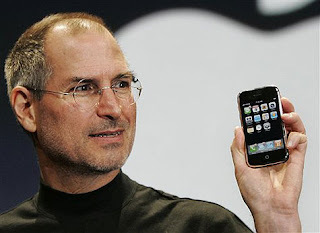 Apple launched the iPhone into the US market in June 2007. The discovery of hazardous chemicals suggests that Apple is failing to make early progress, even in entirely new product lines, towards achieving its commitment to phase-out all uses of brominated compounds and PVC by the end of 2008. "Apple could have demonstrated that it is a true industry leader with a green iPhone. Unfortunately, Apple missed that call and the public is left with an Apple that is no greener than what was promised by Steve Jobs in May,” said Beau Baconguis, Greenpeace Southeast Asia toxics campaigner. “We need to see that the talk of “a greener Apple” is matched with real products in the market,” Baconguis added. Dr. David Santillo, Senior Scientist at the Greenpeace Research Laboratories, coordinated the project and deconstructed the iPhone for analysis. He said, "Two of the phthalate plasticisers found at high levels in the headphone cable are classified as "toxic to reproduction, category 2" because of their long-recognised ability to interfere with sexual development in mammals. While they are not prohibited in mobile phones, these phthalates are banned from use in all toys or childcare articles sold in Europe. Apple should eliminate the use of these chemicals from its products range." During its analysis, Greenpeace also found that the iPhone´s battery was, unusually, glued and soldered in to the handset. This hinders battery replacement and makes separation for recycling, or appropriate disposal, more difficult, and therefore adds to the burden of electronic waste. "Apple is playing catch-up with its other competitors. If it wants to grab industry leadership, it must respond to calls of designing out all toxic substances from its products so that risks from production, recycling and disposal are avoided,” Baconguis concluded. the formation of toxic chemicals, including persistent and bioaccumulative brominated dioxins and related compounds during thermal destruction or processing. (2) Phthalates: The European Directive 2005/84/EC prohibits the use of di(2-ethylhexyl) phthalate(DEHP), dibutyl phthalate (DBP) and benzyl butyl phthalate(BBP) in all toys or childcare articles put on the market in Europe (with a limit of 0.1% by weight). (3) Greenpeace report on the iPhone here. For more information: Click on the Greenpeace Toxics campaign web site here.